Make a fruitful adventure a family affair. Gardening is like magic. A hard little seed turns into a stem with tender green leaves. It keeps growing and then — voila! — a tomato, a pumpkin, or a bright flower appears. It's easy to share this enchanted world with your children. My son's eyes light up when he pulls a strawberry out of the soil or when a sunflower grows taller than him! When you garden with your children, you have the opportunity to bond with them over gourds and grapes while they learn that food isn't made in the grocery store. And, who knows, they might just try some of the veggies they grew with their bare hands! Use raised beds, containers, or clearly delineated pathways so you don't have to worry about your heirloom tomato seedling getting trampled by Spider-Man sneakers. Give the kids a say in what gets planted. Everyone will end up frustrated if you plant nothing but broccoli. Think about planting a variety of vegetables so that while you are waiting for the tomatoes to grow, you can be pulling up the radishes. Let the children push seeds into the soil (big seeds such as pumpkin, sunflower, or beet are better for little hands). Give them a spade to dig some holes. Child-sized garden tools are great, especially miniature versions of Mom's and Dad's. Give the little ones the hose, and have them water around the base of the plants. Or, to buy yourself a few extra minutes to drink your coffee in peace, send them out to the garden with a water bottle or squirt gun. Have the children add mulch (straw or wood chips) 3 to 6 inches deep around the plants, which will keep the plants healthier and leave you with less weeding and watering to do. If your kids are older, point out weeds for them to dig up. Make homemade plant labels on Popsicle sticks or rocks. Be sure to Mod Podge them or use permanent marker so the names won't wash away. Beets can get a bad rap because they're so, well, red. But despite their vibrant coloring, they are delicious, especially roasted; they taste like potatoes, only earthier. You can't go wrong with Detroit Dark Reds. Strawberries are low maintenance and delicious. They send out runners and spread quickly, so it's best to contain them in a pot or raised bed garden, which is built above the ground. You'll have to force yourself to pinch off the runners and flowers the first year so the roots can grow strong, but I promise the second year will be worth it. Plant these seeds as soon as the soil can be worked. Northeaster is a good choice. Sunflowers are fun and whimsical. Show children how the flower heads follow the sun. Sow seeds directly into the soil. Stay small (2 to 3 feet) with Teddy Bear sunflowers or go big (10 to 15 feet) with the Paul Bunyan variety. Cherry tomatoes are perfectly kid sized and make a great outdoor snack. Plant transplants in mid-May. Try Natures Bites. Create your own pumpkin patch. But watch out, they meander and need quite a bit of room. If space is at a premium, consider planting just one or two seeds or plants. Plant in mid-May. Magic Lantern pumpkins don't travel as far as other varieties. Pick a spot. Most plants like sun, so choose a place that gets six to eight hours of sunlight. Buy organic soil for your containers or raised bed. 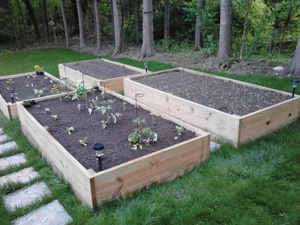 Raised beds can be handmade with the help of a simple online search for instructions or purchased as a prefabricated kit from stores like Home Depot. If you're planting directly in the ground, first pull out grass or weeds. Loosen the soil, and top it with compost (you can buy it pre-packaged and aged from the local nursery or make your own). Plant your seeds directly into loose soil by following the instructions on the seed packet. If you can, find a reputable seed distributor, such as www.harrisseeds.com, for high-quality seeds that are non-genetically modified and suitable for your area. The website has lively plant descriptions and tons of helpful information. Your only problem will be trying to decide between the Cannon Ball or the Prankster pumpkin seeds. Alternatively, you can buy transplants, which have already started growing, from your local nursery for less wait time.